These Loaded Potato Bites can be served at a brunch or as a party appetizer. Although I'm partial to the bacon, green onion, tomato, and cheddar filling included in this recipe you can fill them with your choice of filling and you can even prep them ahead of time! In a medium bowl, combine all of the ingredients. For ease of mixing I usually combine the egg, butter, and the spices first then add the potatoes and stir. Grease two (24 count each) mini muffin pans. Fill each compartment with 1 Tablespoons of the potato mixture. Then, use your fingers to firmly press the potato mixture into the bottom and slightly up the sides of each compartment. I usually use my index and middle fingers on both hands to do this. Bake the potato cups at 400'F for about 25 minutes until slightly browned. Meanwhile, cook the bacon, chop the tomatoes, chop the green onions and measure out the shredded cheese. I usually place the prepped ingredients in separate bowls. As a note, although I'm found of baking bacon, for this recipe I use scissors to cut the bacon into small pieces and cook it over the stove, and drain it well. 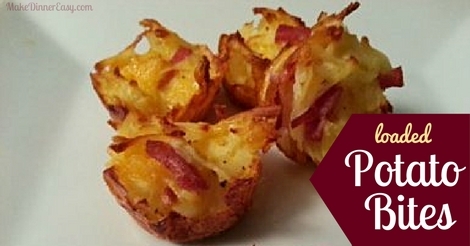 Remove the potato cups from the oven and fill each cup with a bit of each of the bacon, tomatoes, green onion, and top with a sprinkle of cheddar cheese. Return the muffin tins to the 400'F oven and bake for an additional 2 minutes or until the cheese has melted. I would recommend letting these rest in the pan for a few minutes then taking a table knife and running it between the pan and the outside of the potato crust. I usually let them sit an additional 5 minutes before removing each bit with a spoon. 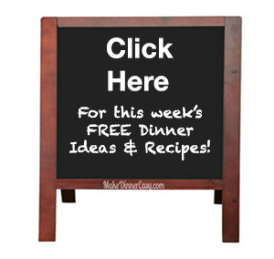 You can place them on a platter and reheat, serve them immediately or even serve at room temperature. 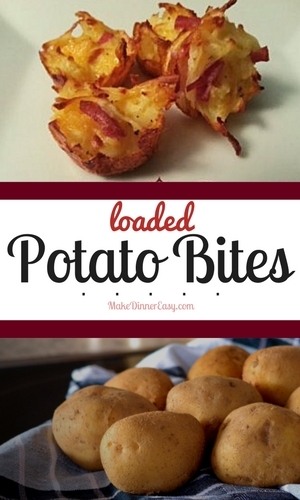 Yield: 24 mini potato cups but expect guests to eat more than one! Make Ahead Notes: You can cook the potato cups ahead and leave out on the counter until ready to fill and heat to melt the cheese.